One of the classic step-through frame types out there is called a mixte. In a mixte frame, the top tube of a traditional frame is replaced with a pair of smaller tubes running from the top of the head tube all the way back to the rear axle. And though this frame was most likely intended for the ladies, I'd totally rock this particular fixie mixte dubbed a Soma Buena Vista from Renaissance Bicycles. I'm diggin' its leather grips, seat, pouch and toe clip straps. Most awesome is this whip's straight up wooden rims. 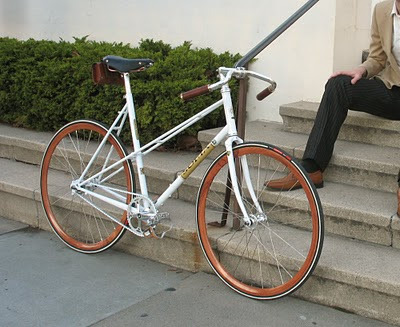 Bottom line, I'm man enough for this mixte. I was dying to get a nice mixte frame for Brandi, but they're sort of hard to find. Not long into the search, a friend suggested we check out a bike he had that might work for her. It turned out to be a sweet mixte! So we got a new old bike for $40 or something silly cheap. Still need to fix it up, but it's already ridable and awesome.